Heat oven to 375°F. Stir Dumpling Mix and 1/2 cup milk in small bowl until soft dough forms. Set aside. Melt margarine in 10-inch skillet over high heat. Add chicken; cook about 3 minutes, stirring occasionally, until outside turns white. 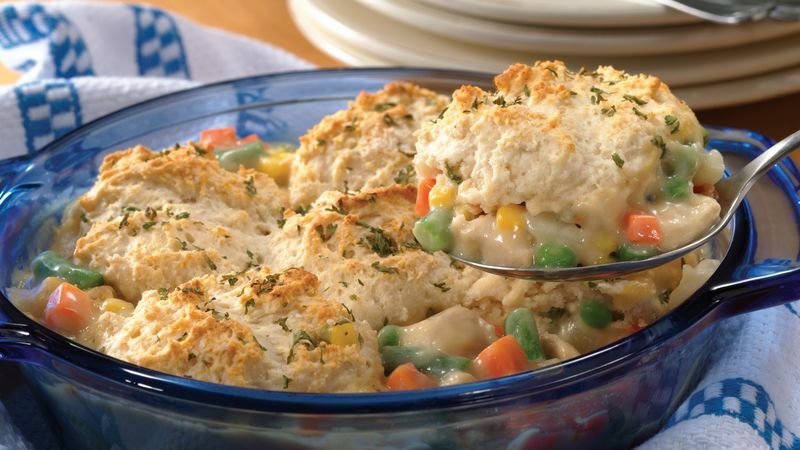 Stir in water, 1/2 cup milk, Gravy Mix, frozen vegetables and frozen potatoes. Heat to boiling, stirring occasionally. Pour into ungreased 2-quart casserole. Drop dumpling dough by spoonfuls onto chicken mixture; sprinkle with parsley flakes. Bake 30 to 35 minutes or until golden brown. Let stand 5 minutes before serving. Frozen mixed vegetables are commonly found in 1-pound bags and 10-ounce boxes in your grocer’s freezer. One popular combination includes carrots, peas and corn. Shredded hash brown potatoes can be used instead of diced hash brown potatoes.